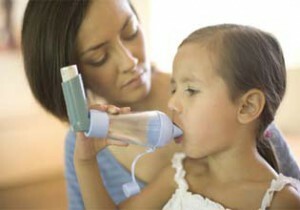 Asthma is a chronic lung disorder that can make breathing difficult. It causes inflammation, swelling, and narrowing of the airways. Asthma can cause repeated episodes of wheezing, breathlessness, chest tightness, and nighttime and early morning coughing. Asthma is hereditary. In most cases the cause is unknown. There is no cure, but learning the warning signs of an attack, by knowing the triggers that cause an attack can assist you in controlling your asthma. It depends on the individuals. Some are affected by smoke, others by other allergens (such as mold or grass) or air pollution and still others may be pet dander. Strenuous physical exercise, some medicines or foods, bad weather such as thunderstorms, high humidity, or freezing temperatures can all trigger an asthma attack. 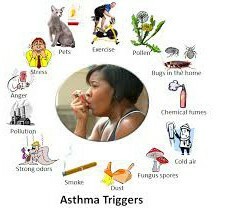 Even stress related to emotional situations can lead to hyperventilation which can trigger an asthma attack. Asthma is difficult to diagnose, requiring a multiple test, including lung functions testing (LFT), testing for allergies, and regular check-ups with your doctor. A spirometry is used to measure the largest amount of air you can exhale, or breathe out, after taking in a deep breath. 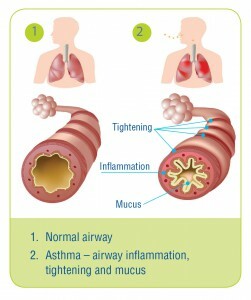 This test is usually done before and after asthma treatment. Avoiding triggers and taking medicine exactly how your physician prescribes it. There are two types of medicine- the quick relief, which controls the symptoms of the attack and the long term control, which will help to have fewer and milder attacks, if you take it as directed even if you are not having symptoms.